Everyday you immerse yourself in the local music scene, and you know a witty filmmaker. You both love music videos. You are best friends. You laugh together, play, dance, and gab about whatever. Then you create an event that’s all about your favorite music videos. You fuse both your passions into one thing. Such is the tale of HLY SHT event VJs Sharlese Metcalf, KEXP and Bobby McHugh, World Famous. Every few months they throw a party… Videoasis at the Northwest Film Forum. This month’s theme? Their birthday celebration. Not just any though because they enticed their audience with an advertisement, “FREE CANDY.” Sean Morrow deejayed on the balcony. The place was packed and was probably even sold out. Wow! Top that. Please enjoy the video premiere that my bestest partner in crime Drake of Jurado Films made of the festivities. 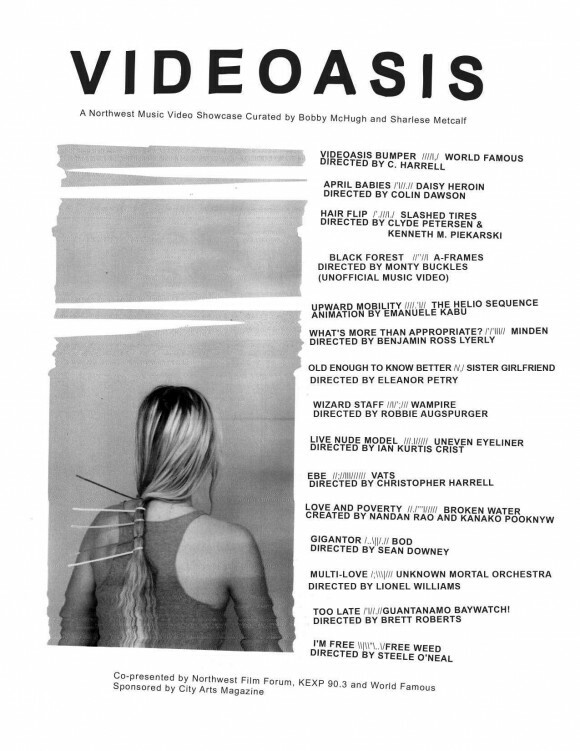 Image of flyer courtesy of the Videoasis event coordinators. Written by: Marz on 07/27/2015. This entry was tagged Bobby McHugh, BOD, City Arts Magazine, Daisy Heroin, FREE WEED, Guantanamo Baywatch!, HLY SHT, Kenneth M. Pierkarski, KEXP, marz time, Minden, Northwest Film Forum, NWFF, Sharlese Metcalf, Sister Girlfriend, Slashes Tires, The Helio Sequence, Uneven Eyeliner, unknown mortal orchestra, Vats, Videoasis, Wampire, Worldfamous. Bookmark the permalink.